The initial goal is to get to 25 likes so I can create a custom URL for the page. Not content with ‘waiting around’ for people to find and like my page, I delved into my blackhat toolkit and revisited a site I used quite a lot in the past, addmefast*. You’ve probably heard plenty about the site (good and bad). 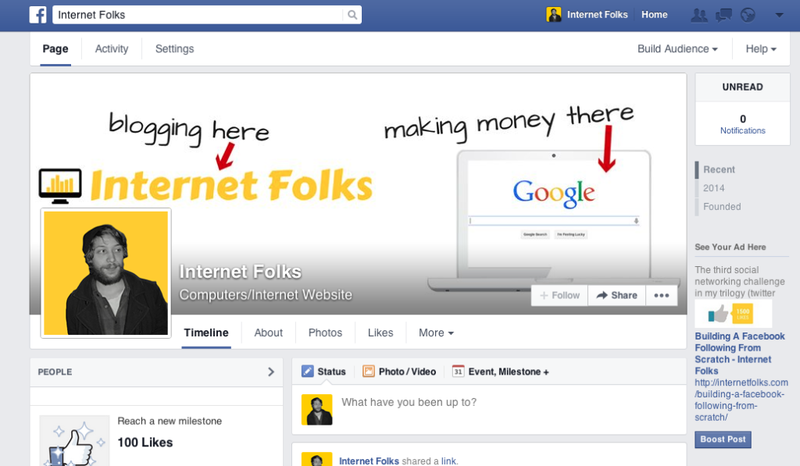 It’s basically a click network for Twitter, Facebook and a bunch of other social sites. Membership is totally free unless you want to buy credits, which I wouldn’t recommend. You earn points by clicking on things for other people, and then you get to spend your points by setting up click campaigns. Some people use it on acid by setting up iMacro, a really neat Firefox add on for task automation, to churn out clicks all day and night but it’s not really worth it. You see, the likes, subscribers, views etc that you get from addmefast are from people like you and me, and by that I mean impatient blackhat SEO-ers! For every iMacro to send out the likes, there’s another one ready to take them all back so don’t bank on your new ‘friends’ sticking around for long. To get some points, I created a burner Twitter account (no email verification needed, added a profile photo to be kind) and shared a few tweets/followed a few accounts. Once my points were adding up, my likes came in, it’s as simple as that. Country targeting is all very well, but without a filter for those dreaded ‘placeholder’ images, addmefast is of little value. If you’re super desperate to get a new facebook page off the ground and don’t have any money/time for marketing, it’s worth getting a handful of likes on there. The real success, however, will come from a lot more hard work. 1. Get 25 likes on your page. You can wait around, beg your friends or, if you like instant results, use addmefast* like I did. Log into your facebook account (the main one, not just the page), then visit the facebook username page. Your main account must be phone verified in order to proceed. Then it’s just a case of selecting the name you want and hoping nobody else has already taken it. Once you pick a name it’s for life (or until you create a new page) so don’t make any typos. Luckily for me, http://facebook.com/internetfolks was free so it’s now my new URL. I won’t be buying/faking any more likes because there’s really no point for the purposes of this site. For starters, I’m using my existing real estate to market my facebook page, aka this website. I added a facebook widget to the sidebar of each post and the homepage (it’s a built in Max Mag theme function, if you want to use the same theme, it’s available here on themeforest*). There are plenty of free wordpress plugins that will work too, like this facebook like box widget. I’m making the effort to post facebook page updates every few days and not just with links back to the site. The strategy is to use each social network (so far facebook, twitter and google+) for different purposes. Lethargic marketing like that described above is part of the reason why social networks make so much money from advertising. People assume that just showing up is good enough – it’s not. If you want to build and continue to grow any social following (or blog following for that matter), it’s going to take a lot more effort and creativity. Yes, it’s a lot of work, but it’s easier than you think if you have a good social media schedule planned (more on that soon).